Envision a succulent alfresco dinner overlooking the beautiful Santa Lucía Bay in one of the most exclusive restaurants in Acapulco; Bella Vista, located in Las Brisas Hotel. The next stop is at La Quebrada, where you will enjoy the world known cliff divers show while you sip traditional Mexican drinks. You'll be transferred from your hotel to Bella Vista restaurant at Las Brisas Acapulco hotel. 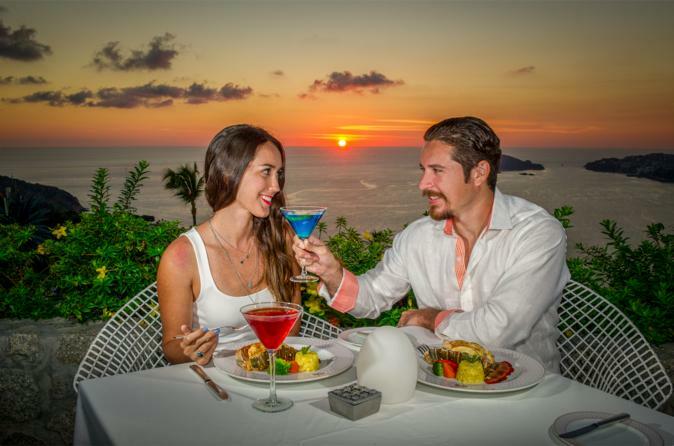 This restaurant is the perfect setting for a romantic dinner and it's located on an ample terrace at the high level of the hotel so you can enjoy a delicious dinner along with a spectacular view of Acapulco. After a delicious dinner and time well-spent at Las Brisas, you'll be taken to La Quebrada. This impressive cliff with 112 feet of height is where brave natives perform an amazing diving spectacle. The real challenge is finding the exact moment to jump. You will enjoy the Cliff Divers show from La Perla at El Mirador Hotel. The restaurant was named honoring "The Pacific Pearl" which is how Acapulco was first known. After a great night out, you'll be transferred back to your hotel.